This couple from Kent, UK came into town on the Liberty of the Seas, with a group of family and friends. It was quite hot today at Mary Molly Hydes beach and I was glad to have my daughter and my soon-to-be daughter in law to help. Wedding planning has been in our family for 25 years, starting with my mum and dad, Francine and Vernon Jackson of Cayman Weddings. I hope my daughter and daughters-in-law will take an interest, not to mention my grand-daughter who would make a great Civil Registrar of Marriages since she is so full of self -confidence. The bride and her mom pause for a quick photo before the signing of the Register. I asked the bride if she would like to send a message back home, and she said "Please tell my sisters how much I miss them, and wish they could have been here. 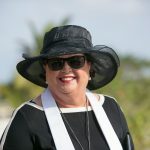 I hope they are having a drink to celebrate as they think of us here in Grand Cayman on our wedding day." The groom and his guys, I am assuming all Liverpool supporters! Explaining the set up for the signing with the Special Marriage License, the copies for filing with our Public Records Office, and my own Marriage Book and the certified copy of the Marriage License which is their copy. The next time she signs it will be a whole new surname...I bet! Watching Uncle Ian sign as a witness. Posing with the little flower-girl who is just two years old. The whole group pose together before boarding the air-conditioned luxury bus which will take them back to the harbour. 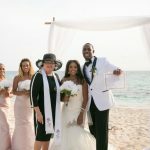 Ceremony by Joy of Weddings, arrangements by Cayman Weddings, photos compliments of Samantha and Peggy, flowers by Trisha's Roses. Ask about our new transportation package for your guests, hassle free air-conditioned comfort straight to your wedding destination and back to the harbour. 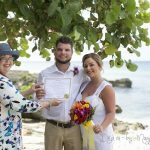 Our professional service and long experience in Destination Visitor Weddings and Destination Cruise Weddings in the Cayman Islands make us the number one choice for locals and visitors alike. Call today (345) 525-6551 or (345)949-8677 for your application form and free e-brochure. 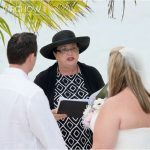 Book early, only one cruise wedding or renewal per day...we give your wedding our full attention, wedding planner always on site for those last minute details.